Thank you for using our digital archives and we hope you enjoyed the holidays. In our current newsletter you will find writing from users overseas as well as reports on archives we have visited abroad. To keep up with our updates automatically, consider subscribing to our newly started RSS feed (→click here for details). 5. 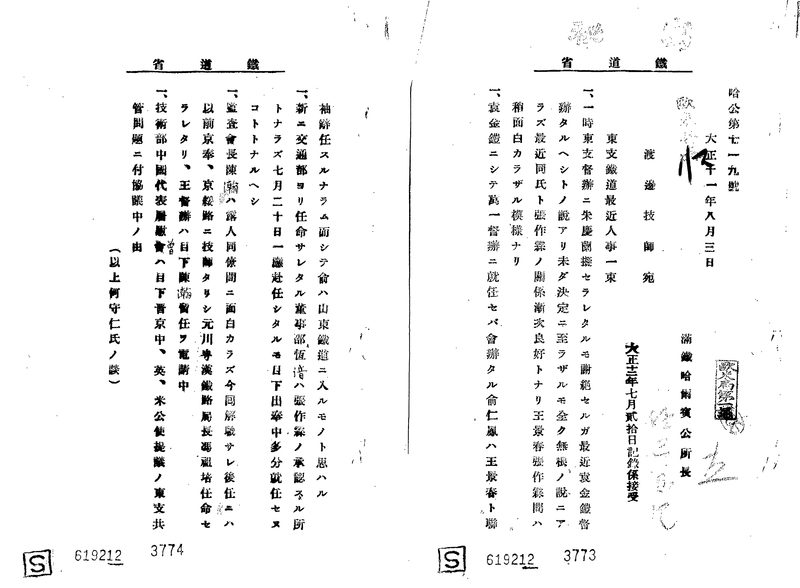 Information on Related Document Holdings　"The Condition of Japan Related Materials in Singapore"
The items released on the JACAR website mainly consist of official documents created by governmental organizations, including army and navy records, which have been provided by the National Archives of Japan, the Diplomatic Archives of the Ministry of Foreign Affairs and the National Institute for Defense Studies of the Ministry of Defense. JACAR also releases documents that were created by semi-public companies, private corporations and other organizations. This article will explore non-official documents related to the South Manchurian Railway Company (hereafter SMR), which was one of Japan's largest employers until the end of World War Two. SMR was a semi-public company established by the Japanese government to manage a railway that ran from Changchun to Lushun. The transport system was part of Manchuria's Russian-built Chinese Eastern Railway (hereafter CER), and it was constructed after the Russo-Japanese War in accord with the Portsmouth Treaty of 1905. SMR's task was not only railway management but also overseeing coal mines and harbor facilities in municipalities within the railway zone. These tasks required negotiation between Chinese and Russian authorities. For colonial management, SMR monitored political situations impacting it and gathered intelligence with its branch offices, which created the documents we have today. The documents created by the SMR, and their related records, are mostly including in the Records of the Ministry of Foreign Affairs. 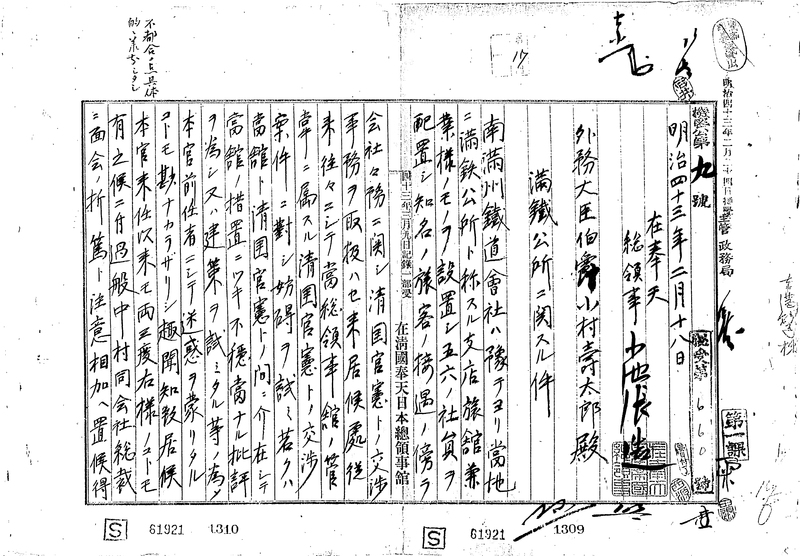 In these archival documents one finds that the first SMR branch office was established in Mukden Castle, May 1909 and supervised by Chief Yasunosuke Sato, a serviceman on active duty. This office in Mukden was responsible for negotiation with Chinese authorities on the purchase of land for a Changchun railway station and its railway zone as well as the Mukden-Andong railway after its establishment. The chief of the office, Sato, had directly negotiated with Chinese authorities about the purchase of land for building the railway (Reference Code : B04010949800) [Image 1]. 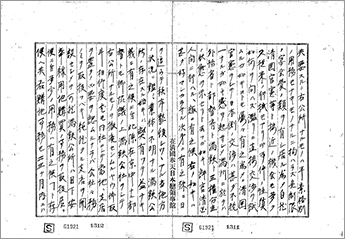 In addition, the office in Mukden gathered intelligence about the Xinhai Revolution in 1911 (* note 1). It seems that the consul general in Mukden Chozo Koike felt displeased about the activities of the office in Mukden. Koike reported that the office has been disturbing the diplomatic autonomy of the consul general and ultimately interfered with activities of the Ministry of Foreign Affairs in Manchuria. Therefore Koike requested that Minister of Foreign Affairs Jutaro Komura abolish the Mukden office in February 1910 (Reference Code : B10074556700) [Image 2-1][Image 2-2][Image 2-3]. Koike had been negotiating with Chinese authorities about the Mukden-Andong railway, so he likely have felt frustrated that Sato had also been in contact with them. 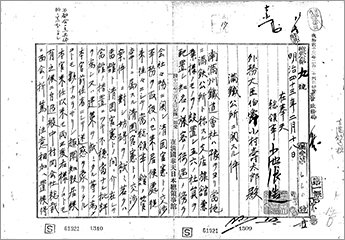 In December 1908 Harbin's Consul General Toshihiko Kawakami requested that the president of the SMR, Zeko Nakamura, establish a branch office in Harbin. It was asked that Kawakami negotiate freight conventions and a line connection with the Russian-built Chinese Eastern Railway (hereafter CER)(Reference Code : B10074556500) [Image 3-1][Image 3-2]. However, there were delays and the office was established in Harbin nearly a decade later in February 1917. 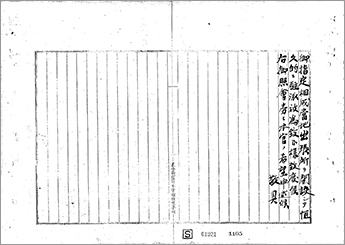 After being reorganized in April 1923, the office in Harbin (* note 2) gathered intelligence on China and the Soviet Union pertaining to CER (Reference Code : B10074592800) [Image 4]. These intelligence reports were compiled (Reference Code : B10074593700) [Image 5]. In addition to the above two offices, SMR created a total of seven others in the following locales: Beijing and Zhengjiatun (January 1918), Jilin (April 1918), New York (January 1922), Qiqihar (July 1922), Shanghai (February 1924) and Taonan (June 1924) (* note 3). These offices around the globe served to also investigate the political situation of Mukden, Jilin and Heilongjiang Provinces along with their markets and products. The offices drew up reports and sent them to SMR headquarters. The transcripts of the reports are included in the record holdings of the Ministry of Foreign Affairs; you can search and browse them with JACAR. Although there is more academic research required to say for sure whether the intelligence gathered by the SMR branch offices altered Japan's diplomatic choices and foreign policies, the documents show the diversity of Japan's activities in Manchuria. This series includes documents that describe the process leading to the outbreak of the Pacific War. This series includes documents examining defense plans on the basis of expected attacks by the Allied Forces, comparisons of national strengths between the Allied Nations, and international situations. 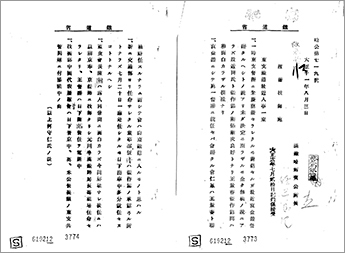 Documents include the Imperial Military Orders dealt by the Army Department, Imperical Headquarters during the period from the second Sino-Japanese War till the Pacific War. It shows what organization of units were made depending on operations at each phase. 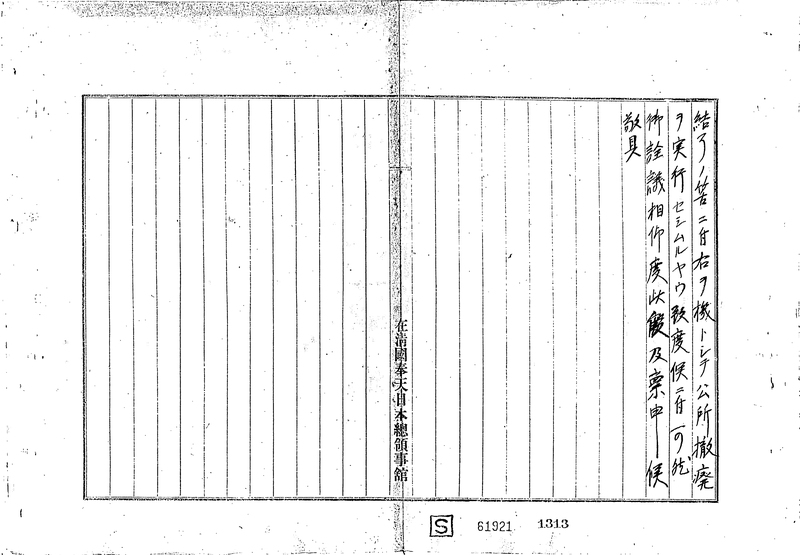 You can understand more detailed movements of units abroad if you read the documents in [Army Records (Rid of Dainikki)> Chuo (General)> Butai Rekisi (Units History)> Zenpan(General)]. Documents include instructions given by the chief of the General Staff Office according to Imperial Commands issued by the Imperial Headquarters Army Section. From the Second Sino-Japanese War until the Pacific War, these documents show what organization of units were made depending on operations at each phase. You can understand more detailed movements of units abroad if you read the documents in [Army Records (Rid of Dainikki)> Chuo (General)> Butai Rekisi (Units History)> Zenpan(General)]. The series includes documents describing outlines and histories of military divisions such as the Imperial Guard. For your reference, "division" here means an organization consisting of units of infantry, cavalry, artillery, engineers and transport, each of which has functions of management, accounting, sanitation, etc. The series includes documents describing outlines and histories of many brigades, including infantry brigades and artillery brigades. "Brigade" here is ranked right below "division", and there are independent mixed brigades consisting of lines. These documents related to the Southern Army were created under the supervision of the Southern Army (Nanpo gun ) in the Pacific War. These items mainly include operation plans and records of campaigns in areas such as the Malay region, Burma, the Philippines, and Indonesia. Starting with information of the Burma Area 5th Army, these documents were compiled with operation plans and records related to the Southern Army during battle. Includes Japanese Imperial Army operation records of the advance into Thailand and the stationing of troops in Northern French Indochina. A gift of Tokugawa Yoshichika, who served as a military administration adviser of the 25th Army in Singapore. These documents are related mainly to the Japanese military government in the South Pacific. Items include military administration records in the Malay and Sumatra areas. Documents include the combat diaries of battles with anti-Japanese guerrillas after the occupation of the Philippines as well as information related to military police and battles with the Allied Forces who aimed to take back the Philippines (in "Shou-ichigo-sakusen"). This series was donated by Miyazaki Shuichi, head of the Imperial Headquarters Army Division during the Pacific War. 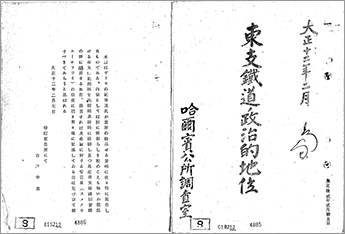 Documents include national defense policy drafts and other items created by the General Staff Office. The compiled items date from the Russo-Japanese War to the end of the Pacific-War. Documents include information on demobilization put together by Miyazaki Shuichi, who acted as Chief of the Investigation Department for Historical Facts 1st Demobilization Ministry. Japanese Imperial Navy operation records from places such as Java, Borneo, the Dutch East Indies, the Philippines, British Malaya and Singapore. Coupled with the records included in [Army Records (Rid of Dainikki) ＞ Nansei (South-West Area)], this series provides insight into military operations. I discovered the Japan Center for Asian Historical Records digital archives in 2007, thanks to archivists of the Ministry of Foreign Affairs of Japan. Not long after accessing the JACAR site, I was very glad to notice how valuable its archives are for me as well as for other researchers. I also found how the website is of great convenience for researching records of interest from my own country without even having to travel to Japan—saving much time, physical effort and money. To the great benefit of researchers, JACAR brought together the documents belonging to the main archives of Japan, respectively National Archives, Archives of the Ministry of Foreign Affairs and Archives of the Ministry of Defence. Thus you don't need to separately research the materials at each of these archives. Fortunately, JACAR opened to the public not only the records related to the relations between Japan and the Asian countries but also those connected to other world states. Because of this variety of documents from all over the globe, the name "Japan Center for Asian Historical Records" might well be changed to "Japan Center for Historical Records." It is desirable that JACAR continues to opened to the public all the records from the above-mentioned archives created before 1945 as well as those subsequently published by the Ministry of Foreign Affairs. It is in the interest of researchers that JACAR asks for the declassification of more documents created after 1945—as much as the legal framework allows. As a diplomat involved for many years in promoting the relations between Romania and Japan, I am intersted in researching the history of our contacts and exchanges from their beginning to the present, based on the records of both countries. From the very start, I found that in order to research JACAR's documents one must have a thorough command of the Japanese language. 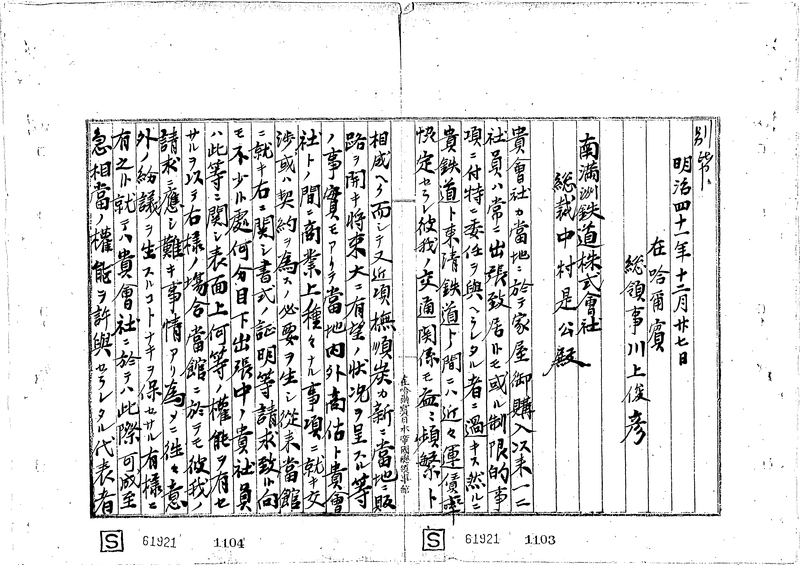 Even though I studied Japanese in Osaka and Chinese at Beijing University, it took me a lot of time to read and understand the handwritten records, particularly those from the Meiji and Taisho Eras. It was very difficult to decipher the "kanji" as well as the phrases and terms used in the diplomatic language. In order to facilitate my reading of the texts, I made a glossary of terms. In my opinion, it is advisible that JACAR presents the main ideas of each document in English and also posts on its site a guide for the phrases and terms specific to old Japanese used in the official records. To understand the spelling of the names of Japanese people—family names as well as first names—or those of different geographic places in the documents was a big challenge, too, even though I used all kinds of dictionaries. Regarding methods to search the records, I used "keyword search," "alphabetic search," and "reference code search". I think the best way to search was the last one, provided that you know your necessary code. JACAR offers the possibility to study a large amount of documents related, also, to many countries that researchers might happen to enocunter in documents and then make valuable connections between them. Thus you get important information with which you can make connections and comparisons. As for me, I was able to compare the contacts and exchanges between Japan and Romania with those of Japan and the other countries from Central and East Europe as well as the Balcan Area. Permanent and provisional exibitions of records and images organised by JACAR on major topics of Japanese history are of great importance as references for researchers. It is desirable that these sorts of effors are extended to another themes, countries and geographical areas. The fact that inside JACAR there are numerous maps and publications as well as photos of different personalities, places and events also further increases the value of these archives. The generosity of JACAR, allowing reserchers to copy and publish its digital images, free of charge, is highly appreciated. 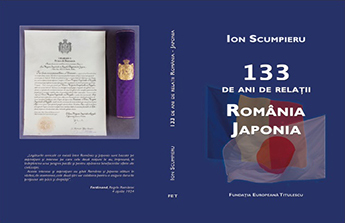 In writting my book 133 Years of Relations: Romania-Japan I made full use of JACAR records. Therefore, I take this new opportunity to express my sincere gratitude to JACAR. In June 2014 we partook in two events in Korea, first at Seoul National University and then at Kookmin University. JACAR researcher Muneaki Hirano spoke about JACAR and Director-General Sumio Hatano gave a lecture. Hosted by Seoul National University's Institute for Japanese Studies, more than thirty people including professors, graduate students and undergraduate students attended our event in SHINYANG Hall II. Then at Kookmin University's Institute of Japanese Studies, we held a seminar to which sixteen persons participated, including professors, graduate students and students. In the introduction to JACAR, a PowerPoint presentation on JACAR's establishment process was given along with an explanation of searching and browsing documents on JACAR's website. 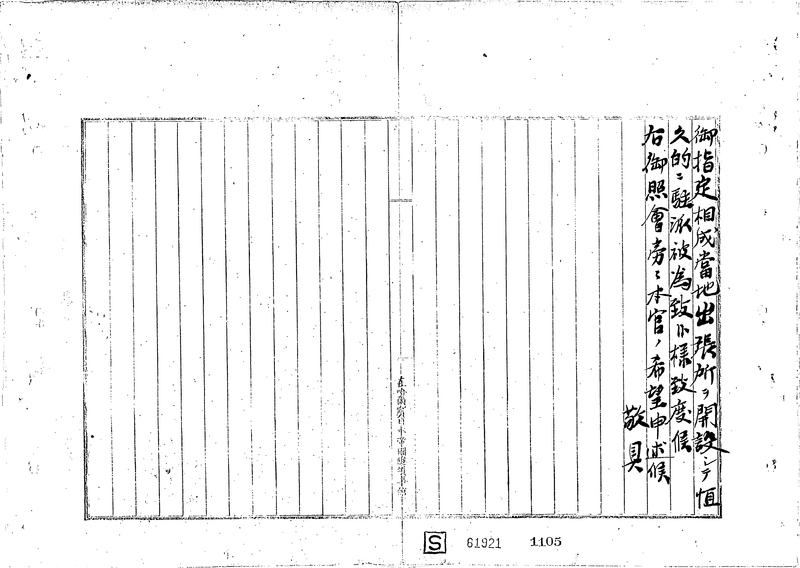 Hirano showed many documents, including the "Korea-Governor's General Office Publications" from the National Archives of Japan report of historical remains in Gyeongju as well as the Korean Personal Names Dictionary; there were also "Records of the Ministry of Foreign Affairs" from the Diplomatic Archives of the Ministry of Foreign Affairs, which includes correspondence between the director of Tsushima (Tsushimanokami) and the Korean Court in 1867 with many diplomatic records concerning the Ganghwa Island incident in 1875, the Imo Incident in 1882, the Gapsin Coup in 1884, and events dating until the outbreak of the Sino-Japanese War of 1884-1885; moreover, there were National Institute of Defense Studies of the Ministry of Defense Army Records (Rid of Dainikki) such as "Korean Route Directions" and the "Korean Land Map (1/50000)" (both edited by the Japanese Army in Korea and later the Seventeenth Area Army). JACAR carried out a survey and about half of the participants at Seoul University and a quarter of the participants in Kookmin University had known of JACAR previously and some of them had used the archive in their research. At both universities, participants asked whether we are planning to publish documents of the postwar period. Other questions were about the situation of documents concerning the Ministry of Colonial Affairs and the law in Korea under Japanese rule. 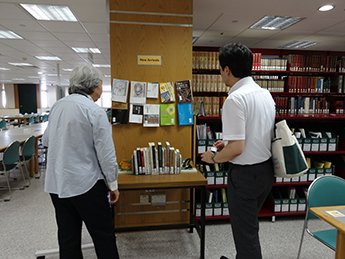 Many participants seemed to show a strong interest in JACAR and hold expectations for future document publications, since many of the Japanese historical documents are connected deeply to Korean history. The North American-based Association for Asian Studies (AAS) has starting a new conference series titled AAS in Asia to promote intellectual exchange within the region. The first AAS in Asia conference was held this year in Singapore and the next ones will be put on in Taiwan (2015) and Kyoto (2016). National University of Singapore hosted the first AAS in Asia event, which had two keynote speeches and eighty panel sessions. Approximately 600 participants attended the conference. JACAR staff members exhibited a booth at the main conference site for outreach activities. Many participants visited our booth between sessions, so there were a lot of opportunities to introduce JACAR's resources and demonstrate how to use our database. At the booth staff also distributed leaflets and souvenirs while surveying participants for ideas on how to improve our services. While many participants had already known about JACAR, a few Asian studies scholars and graduate students were not familiar with JACAR. So our activities at the AAS in Asia conference were beneficial, since we were able to introduce our resources to people who could use them in their research and we could also receive helpful feedback on JACAR. 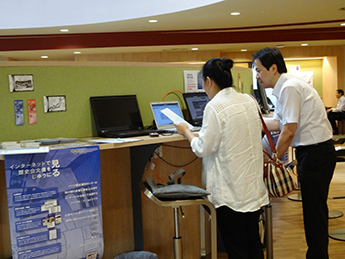 Held booth exhibition and workshop and had collaborative session with the British Library at 2014 European Association of Japanese Resource Specialists (EAJRS) conference in Leuven. Held discussions about researching archival documents with members of the British Library. Held discussions about researching archival documents with members of Imperial War Museum in Duxford. Held discussions about researching archival documents with members of Imperial War Museum in London. This past July two JACAR staff Matsuo and Ono visited four organizations in Singapore that hold Japan related materials. The JACAR team conducted interviews about the archival digitization of the materials and investigated their conditions. Such matters regarding the Singaporean materials and organizations are outlined below. Japan related materials held in the National University of Singapore Chinese Library had originally been managed by the Central Library. The Japanese materials were moved in 2003 to the Chinese Library along with Japan related materials. The Chinese Library collects Japanese materials pertaining to Southeast Asia. There are materials, for instance, issued before Japan's surrender in World War Two. 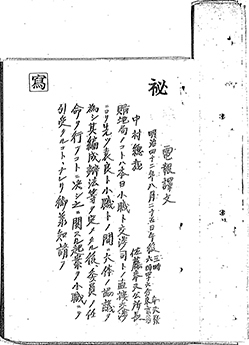 Such materials include the Outline of Singapore (新嘉坡概要) edited in 1923 by the Singapore Japanese Society (新嘉坡日本人会); Gazette of Singapore Japanese Society (新嘉坡日本人会会報) vol. 21 edited in 1936 by the Singapore Japanese Society; and Along the Equator: Guide of Singapore (赤道を往く：新嘉坡案内) edited in 1939 by the Singapore Japanese Club (新嘉坡日本人倶楽部). The National University of Singapore also has a collection of the English newspaper Syonan Times (renamed Syonan Shimbun ), which was printed from February 1942 to September 1945. The Syonan Times and its later incarnation were edited under Japanese control and published with confiscated machines in the occupied office of The Straits Times . There are other language materials in the library that were also issued in Singapore before Japan's surrender. There are the Chinese newspapers Le Bao (叻報), Zhongxing Ribao (中興日報) and Zonghui Xinbao (総滙新報) as well as Chinese periodicals and pamphlets issued by schools and religious organizations. It is not clear how all of the holdings entered National University of Singapore's library. 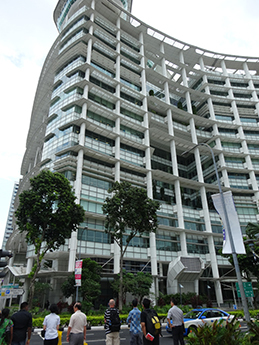 Many were transferred from Ruffles Library, which was the predecessor of National Library of Singapore. Other materials contain ownership stamps originally from Nanyang University (南洋大学), which merged with National University of Singapore. In any case, many of the materials mentioned above are available for browsing in full text and they all have digital catalogue data. The National University of Singapore libraries actively promote digitization and they currently are prioritizing the digitization of materials related to Southeast Asia and the Chinese diaspora dated from before the end of World War Two. Many of the digitized Chinese and Japanese materials are available for browsing online with the links below. 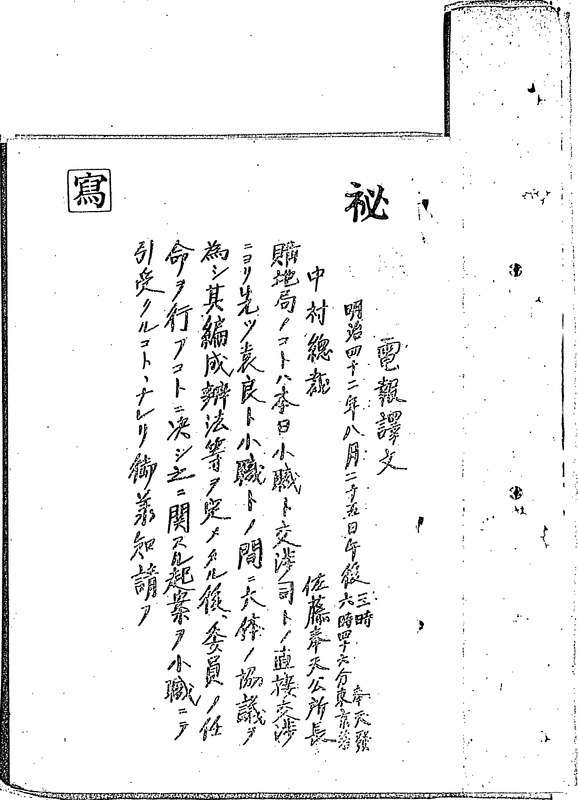 You can read the above mentioned Outline of Singapore (新嘉坡概要), Gazette of Singapore Japanese Society (新嘉坡日本人会会報) vol. 21 and Along the Equator: Guide of Singapore (赤道を往く：新嘉坡案内). However, the newspaper Syonan Times (or Syonan Shimbun) has not been digitized. The Chinese Heritage Center's Wang Gungwu Library holds materials related to research on China overseas. 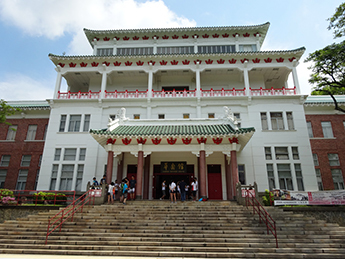 The center is housed in the historic Administration Building of the former Nanyang University, which itself is a relic of the landmark establishment of the first and only Chinese-medium university founded by overseas Chinese. It was registered as a National Monument on 18 December 1999. The Wang Gungwu Library holdings are comprised mainly of donated books and periodicals, consisting of items from current chairman of the East Asian Institute and National University of Singapore University Professor Wang Gungwu (王賡武), items donated by the well-known researcher Cui Guiqiang (崔貴強), and materials from Nanyang Girls' School （新加坡南洋女中）as well as the Chinese High School（新加坡华侨中学）. Materials of the Wang Gungwu Library use the U.S. Library of Congress classification system, so all the items are arranged on shelves by subject. In addition to some Japanese language books, there is a special division of items called the "Early Textbook Collection" (早期课本特藏). The collection contains more than 1200 textbooks and related materials for study and teaching that were used in Mainland China and Chinese schools in Southeast Asia during the twentieth century. The Early Textbook Collection includes many works, such as the Japanese textbook Nihongo Dokuhon (日本語読本), which was written by Uchibori Masafumi (内堀雅文) in September 1943 under the Japanese occupation. Wang Gungwu Library also contains books on Japanese history, such as Nihon Tsushi (日本通史) written by Gan Youlan (甘友蘭) and printed in Hong Kong in 1957. From the 1980s, Singapore gradually unified English as medium of instruction for all the schools. Accordingly textbooks in Chinese have been put out of use. 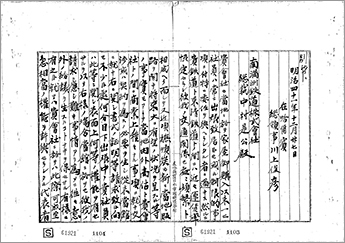 There are, however, Chinese materials in the library that were issued after World War Two, including Zongli Quanshu (総理全書), which was edited by the organization Zhongyang Gaizao Weiyuanhui Shiliao Bianzuan Weiyuanhui (中央改造委員会党史史料編纂委員会). The library also holds Zongli Quanshu (September 1951) as well as seven books that relate to Sun Wen (Sun Zhongshan). As for newspapers, the library has received a few boxes of donated Chinese papers from all over the world, particularly those from after 1980. There are also older newspapers, notably Zhongyang Ribao (中央日報) from 1947. 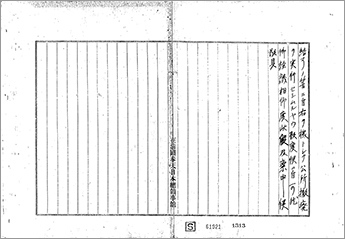 Periodical holdings include the Nanyo Nenkan (南洋年鑑) edited in 1939 and 1951, Nanyang Xuebao (南洋学報) issued from 1940 to 1998, Nanyang Yuebao (南洋月報) edited in 1950, Nanyang Yanjiu (南洋研究) edited in 1959, and Nanyang Wenzhai (南洋文摘) issued from 1960 to 1974. All of these periodicals were published in Singapore. As for digitization, there are no plans currently to digitalize the above materials. The National Archives of Singapore does not have many documents created by the Japanese Army or its government under the Japanese occupation. The reason for this is due to removal by Commander Yamashita Tomoyuki and incineration by the Japanese Army upon its defeat. As part of its effort to fill certain gaps in its collection, the National Archives of Singapore has collected oral history records and other records from various sources. There are records from some 4,000 individuals, including almost 400 oral histories related to the Japanese occupation. The persons interviewed included Chinese, Malays, Indians, Japanese, Australians and the British. The National Archives of Singapore also has photographs that include images of Japanese society, the occupied Malay Peninsula and Singapore. There are, additionally, donated materials from personal collections as well as military currency or "banana money", which had been issued by the Japanese Army. 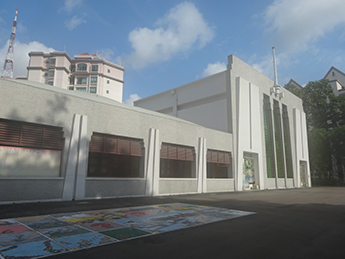 The National Archives of Singapore also acquires and preserves public records that have been appraised to have national and historical significance. Under the National Library Board Act, government agencies are required to transfer such records of value to the Archives for long-term preservation. The decision of which records are to be preserved or destroyed is conducted jointly between the Archives and the respective government agency. The National Archives of Singapore holds less than five percent of the preserved government records in original paper form. This is due to the relative size of Singapore, which makes it is important to conserve space. As a solution, many records are digitized or preserved in microfilm. When records have existed for 25 years, they may be open for public consultation, subject to the conditions imposed by the transferring government agencies. Records which have been declassified are available for reading in the Archives Reading Room and in some cases, permission is granted by the transferring government agency for reproductions to be made especially if the purpose is for education or research. Permission is required for commercial use. The National Archives of Singapore is digitizing the above mentioned donated materials from personal collections and plan to finish the project this year. However, some materials mentioned will not be released openly online due to privacy issues and copyright restrictions. National Library of Singapore holds Japan related materials, many of which were created under the Japanese occupation. There are also a few items dating prior to World War Two and many from after its conclusion. Such materials can be found on the seventh to the thirteenth floors of the library, which is called the Lee Kong Chian Reference Library. The space commemorates Lee Kong Chian (1893-1967) who was a great supporter of the library and whose Foundation continues to regularly support the National Library of Singapore with donations and sponsorships. In addition to other items, there are a few textbooks for the study of Japanese National Library of Singapore holds Kurakane Yoshiyuki's Syonan Nippo Series, Illustration for Study of Japanese Language (昭南日報叢書 日本語図説) published in 1942, Okamoto Yasuo's Japanese Intensive Textbook (日本語速成教本 コクゴノホン) published by Syonan Honganji Nihongo Jyuku (昭南本願寺日本語塾), in 1942, and a text book Japanese Language for study in General Public School (普通公学校用 日本語) edited by the Education Section of Malaya Inspectorate of Military Government (馬来軍政監部文教科) published in 1944. Furthermore, the library also holds the book Industries in Southeast Asia (南洋之産業), which was issued by Nan'yo Kyokai Singapore Shohin Chinretsukan (南洋協会新嘉坡商品陳列館) in 1920. 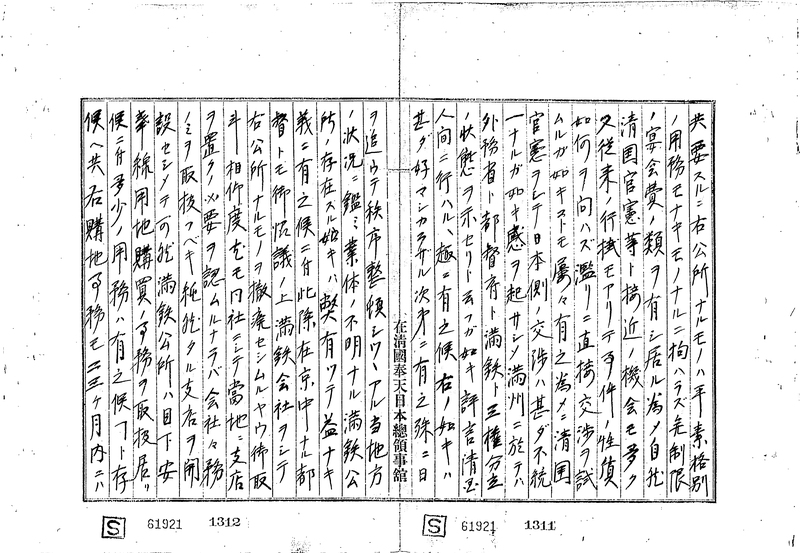 Some of these Japanese documents have been possessed since the establishment of the National Library of Singapore and others were donated more recently. As for other language materials created under Japanese occupation, there is the English newspaper Syonan Times (renamed Syonan Shimbun ), which was printed from February 1942 to September 1945. They also have the English newspaper The Young India , which was printed from July 1943 to December of the same year. And there are English books also published under the Japanese occupation, including The Good Citizen's Guide, Handbook of Declarations, Orders, Rules and Regulations etc. , which was edited by the Japanese Military Government Inspectorate and the Syonan Special Municipality (軍政監部・昭南特別市), and published by Syonan Newspaper Company (昭南新聞社) in 1943. Concerning Chinese materials, the National Library of Singapore holds the Chinese newspaper Zhaonan Ribao (昭南日報), which was printed from February 1942 to May 1944 during the Japanese occupation to replace Xingzhou Ribao (星洲日報). 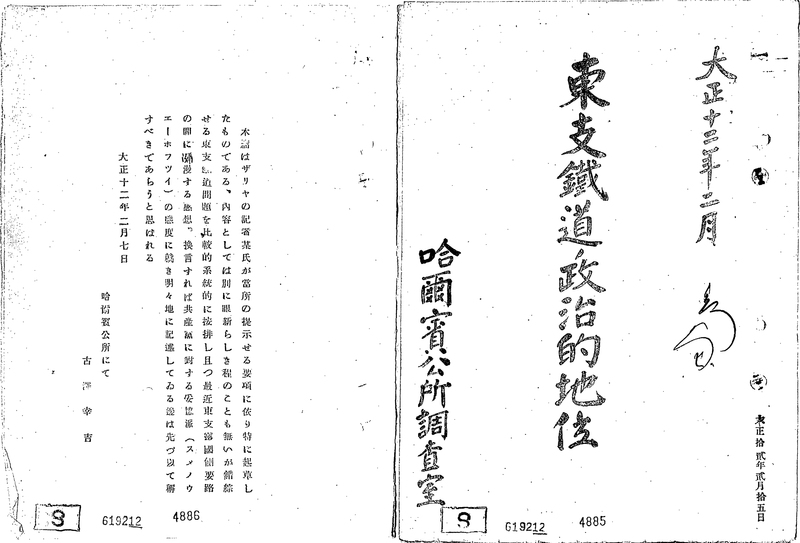 There also are Chinese periodicals such as Zhaonan Huabao (昭南画報), which was edited by Chen Rihui (陳日輝) in 1942. Moreover, there is the Chinese book Zhaonan-dao Xinsheng Yinianjian (昭南島新生一年間), which was issued by the Zhaonan Ribao Publication Company (昭南日報出版社) in 1943. There are a wealth of public documents in the National Library of Singapore, notably Japanese occupation era (1942-1945) documents collected by Koh Seow Chuan and generously donated to the National Library. These documents include property title deeds, receipts memos and reports. Public documents are available such as maps like the 1944 Map of Johor and Singapore . The National Library of Singapore currently is digitizing many of their holdings. They have already finished a part of the above mentioned materials: Map of Johor and Singapore , Zhaonan-dao Xinsheng Yinianjian , Documents from Japanese Occupation of Singapore, 1942-1945 , and The Good Citizen's Guide, Handbook of Declarations, Orders, Rules and Regulations etc. These materials cannot often be released on the internet because of copyright laws. The Syonan Times has already been digitized, but it cannot be released as it is no longer possible to contact the publisher. In Singapore the release of digitized data on the internet requires permission from publishers or for an item to be considered public domain, the latter which requires seventy years to have elapsed since the author's death. Although the materials mentioned above have not yet met these requirements for online release, it is possible to browse them from within the library's local network. "Education in the Meiji Era"
In the Meiji era Japanese sought to better cultivate domestic talent to serve the state. This exhibition explores education laws and regulations that shaped the school system, with new teaching materials and pedagogic methods, for example, at the elementary school level. "Massan: The Life Story of Masataka TAKETSURU"
Japan and Scotland have enjoyed its close relations for a long time. This exhibition presents two countries' exchanges and revealed the story of Masataka TAKETSURU and his wife Rita. The couple, Masataka and Rita, certainly embodied deep relationship between Japan and Scotland. Thank you very much for reading this issue of JACAR's newsletter, for which we are pleased to have been able to include writing not only from Asia, but from Europe as well. We hope you also found it helpful that there has been a report given on documents in Singapore. In any case, we plan to release the next issue of this newsletter in March, so please stay tuned. To make the newsletter an even more useful reference in the future, we would deeply appreciate any comments or feedback on * THIS FORM *.